Abcmd.exe can copy disc to another disc from command line. It will perform a sector-by-sector copying. All information in the source disc will be copied to the new disc. Using the command line switches, you can set lots of copying options, such as verifying, burning speed, ejecting disc after copying, creating temporary file for copying, and etc. If the source drive and destination drive are the same drive, the utility will prompt you insert the disc when copying. -verify: Verify written data after copying. -eject: Eject disc after copying. -create-temp-file-for-copy: Create temporary file to cache source disc before copying disc. 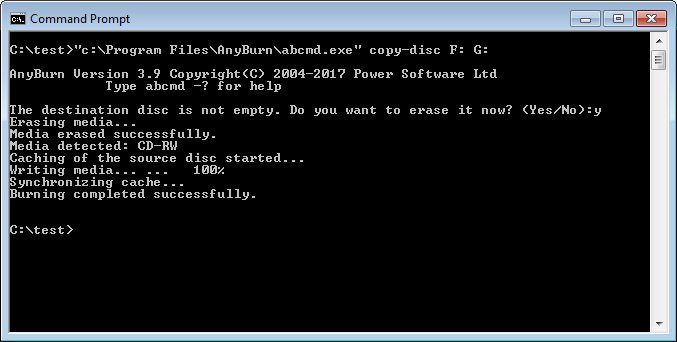 Example: Copy source disc to another new disc. The source disc is in drive F:, while the destination disc is in drive G:.